Promotional value expires Jul 16, 2019. Amount paid never expires. Not valid on federal holidays. Must sign waiver. Subject to weather. All riders must be 48″ tall. Maximum combined weight of 450 lbs. between both riders. All riders must present a valid ID. Must be 21+ after 7:30 p.m. Not valid for special events or buyouts. Limit 1 per person, may buy 2 additional as gift(s). Limit 3 per visit. Merchant is solely responsible to purchasers for the care and quality of the advertised goods and services. Offer is not eligible for our promo codes or other discounts. Stretched between two of the Rio’s skyscrapers, the VooDoo Zipline at the Rio Las Vegas sends riders on a breathtaking journey as they soar above the neon playground of The Strip. 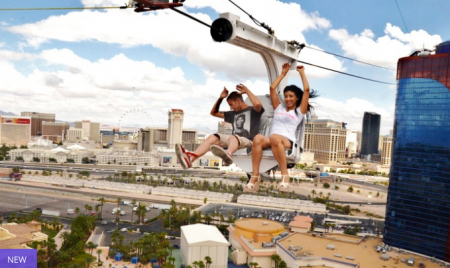 First, attendants strap guests securely into a tandem seat, suspended nearly 500 feet in the air by strong metal cables. Then, as the riders’ friends cheer from the Rio’s 51st floor patio, the double-seater zipline throne flies at 33 mph over an expanse of pools, palm trees, and tall buildings.